Rhythmical Massage Therapy had its origins in the 1920’s through the impulse of Ita Wegman, a physician who was also trained in physiotherapy and Swedish massage. She worked closely with Rudolf Steiner to establish a clinic in Switzerland for the practice of anthroposophical medicine. It was at this clinic that Ita Wegman applied the spiritual scientific understanding of the human being to Swedish massage. Joined there by Margarethe Hauschka, MD, the two collaborated for twelve years to further develop this new approach to massage therapy, which Dr. Hauschka later called “Rhythmical Massage as indicated by Ita Wegman, MD.” Initially RMT was practiced by massage therapists and nurses in anthroposophical clinics and Camphill communities. In 1962 a professional training course for Rhythmical Massage Therapy was established in Bad Boll, Germany by Dr. Hauschka. Today, RMT is practiced in many healthcare settings throughout the world. The Rhythmical Massage Therapy Association of North America (RMTA) has been an informally organized association of Rhythmical Massage therapists for almost 25 years. 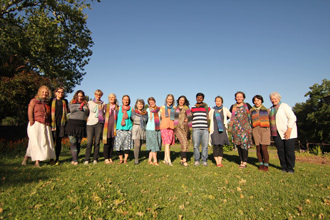 Ten new rhythmical massage therapists completed the recent three year training sponsored by RMTA, graduating in April 2017 at Rudolf Steiner College in Fair Oaks, CA. A roster of potential students for subsequent trainings is currently being assembled, with location and other practical logistics to be determined. Introductions to the work will be held in various regions around the country. In addition, five ​North American ​RMT teachers are in process of completing their Medical Section certification. The RMTA also offers annual continuing education conferences for professional practitioners. Continuing education credits from the National Certification Board for Therapeutic Massage and Bodywork (NCBTMB) are earned for attending. As the Association continues to grow, more activities allowing for sharing rhythmical massage therapy with those who might benefit continue to be part of its core mission.